Readers may know that Li Ka-Shing’s Concord Pacific bought Vancouver’s massive Expo Lands in 1988, developed Yaletown, and still has long-term plans for 10,000 to 20,000 more high-end condos on North False Creek. Concord Pacific, now run by Terry Hui, remains a major player in Vancouver’s developer oligopoly, with most new housing inventory planned beyond 2013 in Vancouver under its control. Concord’s ‘land bank’ comprises a large portion of Vancouver’s undeveloped lands, including much of False Creek, as well as 58 West Hastings – the site of 2010’s Olympic Tent Village. Concord exerts its power over Vancouver housing prices by developing its ‘land bank’ very slowly as high-end condos. These and similar undeveloped properties and empty condos controlled by Vancouver’s oiligopolist developers (such as the Aquilini Group, Wall Financial Corp., Concert Properties, Holborn Properties, and marketing ‘coordinator’ Bob Rennie) are reasonable targets for #Occupy. So too is the mostly empty Olympic Village. People blew whistles, beat drums and banged metal cups to express their unhappiness. Many waved flags calling for universal suffrage while others chanted “Down, down with property tycoons” and called for Chief Executive Donald Tsang to step down. One of the big themes of the march, held on a public holiday marking the 14th anniversary of the handover, is the growing rich-poor divide in Hong Kong, where skyrocketing property prices have left many residences unaffordable and forced out small shopkeepers. March organizers said they wanted to protest the “hegemony” of Hong Kong’s big property developers over the market…Some protesters carried large signs depicting Tsang and billionaire Li Ka-shing, Hong Kong’s richest man whose business empire includes a major property developer [Cheung Kong Holdings], with devil horns and vampire fangs. They chanted slogans accusing the government and developers of colluding to establish a monopoly. Housing prices in Hong Kong have been driven up by ultra-low interest rates and excess liquidity, and the government has tried to cool the market by introducing measures twice since November. It is a mistake to for either Vancouverites or Hong Kongers to blame their inflated housing market on “foreigners.” In both city-states, the crisis is produced and managed by a development oligopoly, which uses the same tactics. We must be explicit here: it is ridiculous for Vancouver or Hong Kong to blame each other for their affordability crises. There is, in fact, not two, but one crisis. It’s time to make explicit alliances with the housing movements in Hong Kong. If the people can fight back in New York and Hong Kong, there is no reason why we can’t do it here! Ng Kang-chung and Chloe Lai. “Protesters say Li Ka-shing is city’s real boss,” South China Morning Post, Apr 9, 2011. Sunita Sue Leng. “Hong Kongers fight developer hegemony,” The Edge Singapore, Tuesday, 26 April 2011 14:54. “Hong Kong march develops tone of protest,” The China Post, Saturday Jul 2 2011. 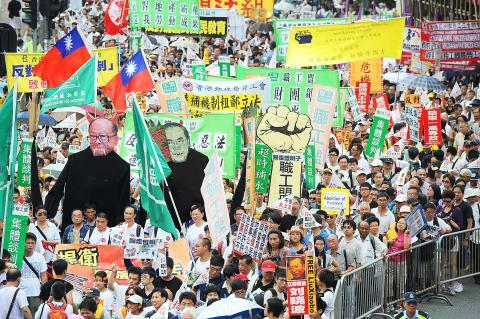 “Hundreds held at Hong Kong rally,” BBC, Jul 2 2011. Ng Kang-chung and Amy Nip. “Unhappy campers take on ‘Superman’; Activists to lay siege to Li Ka-shing’s HQ in protest against ‘property-developer hegemony,'” South China Morning Post, April 8 2011. Posted in #occupyvancouver, Features, Housing, Olympic Village, Public Expression. Bookmark the permalink. Great article Tristan. Perhaps occupying a lineup at the new stadium would be more appropriate for Vancouver. Very good article Tristan, nice to find another source of inspiration for this new wave of occupation (or sustained protest), beyond the well known Arab spring and Greek/ Spanish occupations of late. I agree that what you’re presenting is an extremely worthy cause for protest, and should/will be a very strong and welcome presence at this rally, but I think all of us progressives should be wary of trying to label this as any specific kind of protest, especially before it happens. There is a multitude of injustice in the world, from inaction on climate change, to violence/discrimination against women and first nations, and I think it could do a disservice to the cause by trying to isolate this to just one issue. And don’t get me wrong, I don’t think you’re meaning to do that per sé, but I believe the nebulous property of occupywallst has been the key to its success thus far. Insofar as it is broad and inclusive enough to unite its supporters, and complex and multifaceted enough to confuse its detractors. Again, great article, just thought I’d throw this out there. very interesting indeed – so much so that i thought about it for a second and came to the realization that forums don’t post opinions, people do. If you have a contrary opinion, why not join in the tradition of civil, impassioned debate on themainlander.com? I posted an opinion, but obviously, they did not like my exposure of the holes in their logic. Hong Kong has low taxes.